This section is especially created for our Indian Vegan fans. We have carefully selected recipes that are free from non-vegan products such as yoghurt, milk, paneer and cheese. 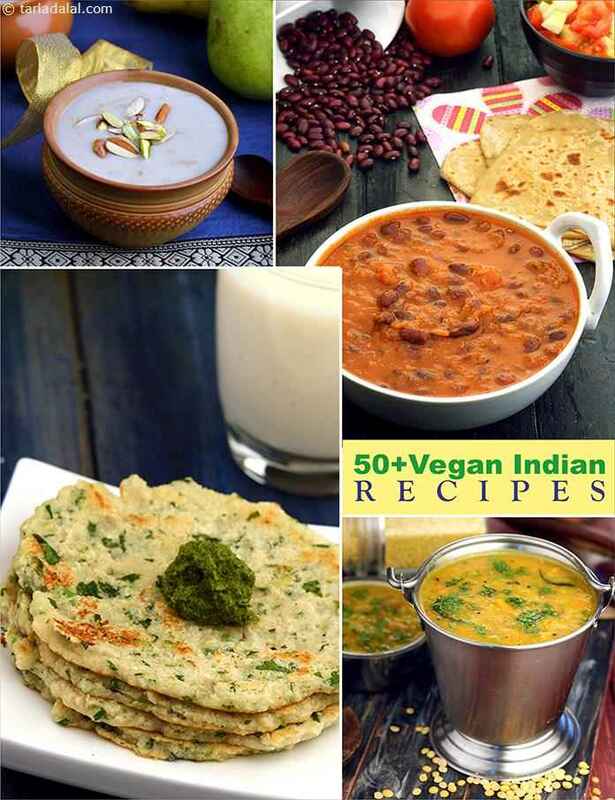 We have included a wide range of recipes coming from different parts of India. Fruits and vegetable can surprisingly be used more innovatively to make wide range of courses like breakfast, rotis, curries, snacks and desserts too. Spice is what perks up the flavour of these ingredients. Enjoy the South Indian Sambhar from morning breakfast with Idli. Then try the Punjabi Rajma Curry with some Brown Rice. The Mahrastrians love their Usal with a Bhakri. Follow our detailed list of Vegan Curry recipes. Oats Upma is a healthy option to give your kids. Then there is Rice Moong Dal Idli with some Sambhar. Follow Vegan Breakfast recipes for more details. Large options available from Cocnut Chikki to Pear Rabdi with Oats Milks. Follow Vegan Sweet Recipes for more details. Try the super healthy Jowar Kale Palak salad which is a meal by itself. For those who love sprouts, there is Bean Sprouts Suva Salad. Follow here for more Vegan salads. With the vegan ingredients in your pantry make these Indian delicacies… and get ready to gather those applauses.